Welcome to the 3rd installment of the Cherry Blossom Dress Sewalong! Hopefully you’ve managed to get your bodice pieces drafted and cut out. Today we’ll be cutting out the skirt. The skirt of the Cherry Blossom Dress is a circle, made up of 4 quarter circles. We won’t be making pattern pieces for this as there’s no need. Instead, we’ll be working out the dimensions using a little bit of maths, then we’ll measure it out straight onto the fabric and cut it out. If you have a rotary cutter you’ll be able to cut all 4 pieces out easily. If your a scissors person, you’ll still be able to cut them out all together as long as you use plenty of pins :). 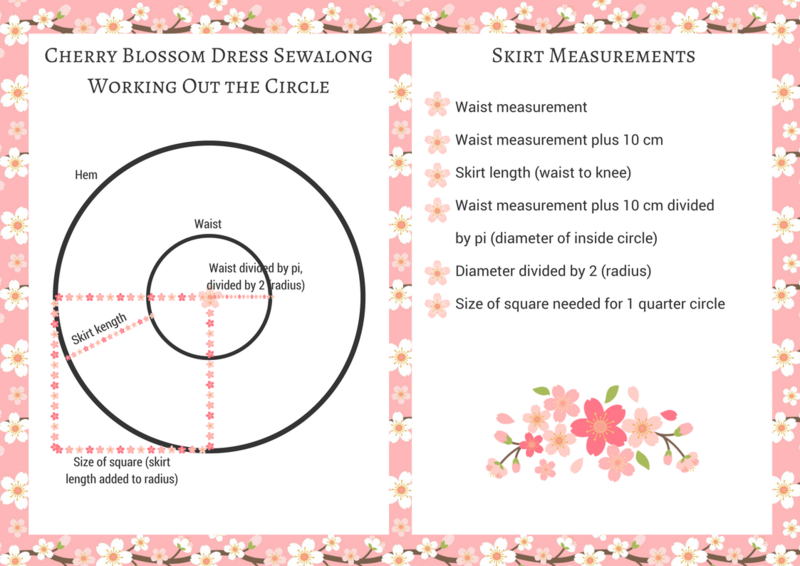 You’ll need the printable with your measurements on, and the skirt measurements printable. You will need your waist measurement plus 10 cm, and the measurement from your waist to just below your knee. The skirt of the Cherry Blossom Dress is basically a circle with a chunk out of the middle. It’s a bit like a doughnut. We’re going to cut 4 quarters of doughnut out of 4 squares of fabric. At the moment, the measurements you have tell you how wide the doughnut is, and how far it is round the inside of the doughnut. To work out how big the squares of fabric need to be, and where to cut the hole out of the middle, we need to work out the distance from the inside edge of the doughnut to the centre of the hole. Then we’ll add this to the distance across the doughnut. To work this out we need to use pi. Put simply, the distance around the edge of a circle is roughly 3 times the distance across the middle of the circle, passing through the centre. Pi is that number exactly. So using pi will enable us to work out the distance from the inside edge of the doughnut to the centre of the hole. On your measurements printable, find your waist measurement plus 10 cm. Now divide that number by 2. The reason for this is that we only need to know the distance to the centre, not right across the circle. Record your answer on your printable. Now find your waist to knee measurement. Add this answer to it and record it on your printable. This number tells you how big you need the squares of fabric to be. Take your waist to knee measurement plus the distance from the inside circle to the centre. Add 5 cm or so. Cut out 4 squares of fabric this size. For each square, you’ll need to establish which corner is the top. When sewing the skirt front and back, it will hang better if you have the grain running up and down the centre seam. So when cutting out the skirt 2 pieces, make sure you have 2 with the right side up and 2 with the wrong side up. From the top corner, measure down one side and mark off the distance from the centre to the inside edge plus your desired skirt length. Do the same along the other side. Then measure across the skirt, marking off with pins at regular intervals. Cut along where you have pinned. Now take the distance from the inside edge to the centre, and measure down and mark off. Do this on the other side too, then measure across with the tape measure and mark off. Cut along where you pinned. These are your skirt pieces cut out! The next stage will involve assembling the front and back skirt sections and sewing them to the bodice. Hi Anna, I’m just about to start the skirt & the video doesn’t appear to be working! Cheers Lou. Hi Lou, the video should be working now. I think I’m still learning with the youtube thing! Hi ya, I’m just doing my maths & thought I would double check using the link you have given earlier but unfortunately it’s confused me even more! I’m not sure why my waist radius seems to change according to whether it’s a full, half or quarter skirt according to the sites calculations? Can you help please, here’s my figures. Waist measurement is 75cm, plus 10 is 85, divided by pi is 27.05 &dived by 2 is 13.5. I decided I wanted a longer skirt so waist to approximately ankle length is 85cm. So size of square should be 13.5 + 85 + 5 = 103cm. Hope this makes sense, thanks Lou. Thanks Anna, I can cut this with a bit more confidence this afternoon! Again I am asking. The calculations state I can’t use 45″ wide fabric. I bought5 and 1 /2 yes. I wish you had stayed that in your beginning lesson. I have sent this message but have not received a response from you. Hi Sheila, I did actually reply to your previous comment. The calculations are wrong. That’s plenty of fabric. If you let me have your measurements, I’ll work it out for you. My waist is 41inches before adding the extra for comfort my waist to knee is24 inches. Thank you. I did not see a reply from the first comment. Hi Sheila, here’s the measurements for the skirt of your dress. I added 4 inches to your waist measurement for seam allowance and ease of wearing. You’ll need to cut 4 squares of fabric 33 inches by 33 inches. For the bottom edge of the skirt, measure 31 inches down from the top corner. For the waist, measure 7 inches down from the top corner. Just one thing though, when I checked, the internet said that a UK size 14 waist is 31 inches, so do you want to check your waist measurement again? I’ll work out again for you if it’s different. A I’m using a king size duvet cover, I have enough fabric to cut two on the fold. Is that going to cause any problems further down the line?